We, hikers, have it pretty easy. If we want to hike somewhere, we simply load our packs and go. Aside from good footwear and some basic clothing, we generally don’t need a lot of stuff. In fact, if we want to travel somewhere for a hiking vacation, and we’re efficient, we can load everything that we need for the trip in a single bag and carry it on the plane. The only thing that can be tricky is trying to carry trekking poles on the plane. Since 9/11, trying to carry trekking poles on the plane has been a challenge for hikers who fly. Intuitively, trekking poles should be off limits, but, in fact, they fall into a grey area with TSA, the Transporation Security Administration of the United States. So where does that leave trekking poles? They’re virtually identical to ski poles, but it could be argued that they fall under the category of walking canes as well. 1. Talk to the TSA officials at your local airport. We spoke with officials at three different airports and, in every case, they allowed us to carry trekking poles on the plane in their assembled forms. That said, there are two caveats. First, small, rural airports that border vacation destinations tend to allow items that larger urban airports may not. They’re used to people traveling with sporting equipment and oddly shaped gear. Second, consider your itinerary. Just because your local airport allowed you to carry on your poles, doesn’t mean that the security personnel in Amsterdam will. Flying direct routes within your home country might be fine, but if you have to go through security in other cities and/or countries while changing flights, you might get screwed. 2. Dismantle your poles before placing them inside your pack. We’ve had good luck with this option so far. 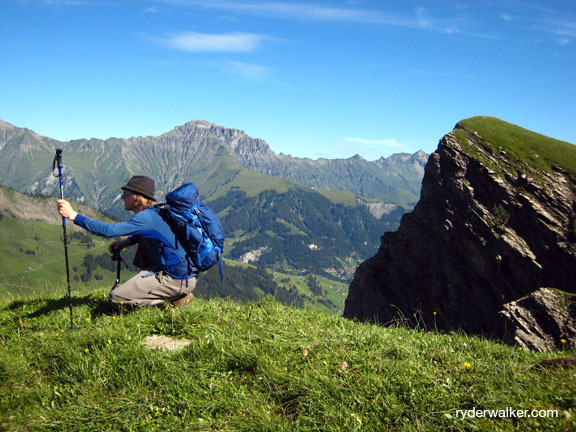 Simply pull the sections apart so that your trekking poles look like small tubes rather than a long collapsible unit. As it turns out, it’s not the pointy tip of the trekking pole that security personnel have a problem with. Rather, they want to confirm that you don’t have anything stashed inside your poles. The take home point: break down your poles for easy examination. 3. Consider the Z trekking pole by Black Diamond. We knew this pole would be cool when we first wrote about it, but we didn’t know how cool. Acting on a hunch they would be too weird to register on the TSA radar screen as a disallowed item, one of our staff members tested the Z pole by placing it in their carry on. The result: they cruised through the security zones in the U.S. and Europe without a hitch. The experiment was a total success. If you really want to carry trekking poles on the plane, but you don’t feel talking to TSA, and you don’t want to disassemble your poles each time you fly, then consider the Z trekking pole from Black Diamond. It even comes with its own carrying case. Super cool. Image: Willi uses his trekking pole to harness the power.